The term is a euphemism: a phrase that takes something with negative connotations and applies a positive sounding, or abstract label. “Unconventional” means, literally, something done in a way different from the way such things (or activities) are usually done. As applied to gas/oil exploration, it means that the fossil fuel will be extracted with methods other than standard ones, or from areas not commonly tapped for gas/oil. 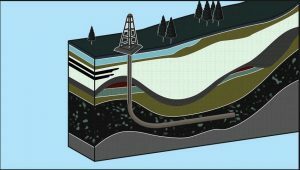 An unconventional method would include hydraulic fracking, where drilling is started in a vertical direction and then shifted to a horizontal direction at some point in the subsurface, as opposed to drilling which is vertical only. An unconventional area might be the frigid Arctic or very deep spots in water bodies. Most of the “unconventional” drilling methods and locations involve greater risks than conventional drilling. So calling it “unconventional” sounds quirky, maverick, even creative or fun. Such associations effectively hide the opposite: dirty, dangerous, risky, toxic drilling for hard-to-get gas or oil. Name some other unconventional ways of harming the environment. What are the risks from unconventional exploration for gas or oil when compared to conventional exploration? What is “green washing” and how is it related to euphemisms? “Fracking on the Island of Ireland: Insurmountable Hurdles,” in Reports section of irish environment magazine (February 2017). “Greenwashing” in iePEDIA section of irish environment magazine (December 2009).